Update to article – The Brinkmann Trailmaster Limited Edition may not be available any longer. This Oklahoma Joe Longhorn is, from what I can tell, the exact same smoker with the same features. I had been using my Brinkmann Smoke N Grill that I wrote about in this article and it did a pretty good job. 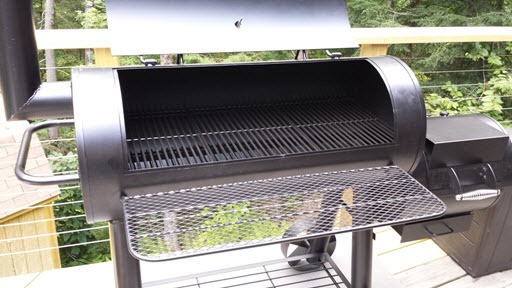 It’s actually a great 1st smoker for any BBQ enthusiast to get their feet wet. But, to be perfectly honest, it was difficult to maintain temperature with the Smoke N Grill which is a vertical water smoker and maintaining temperature is one of the most important factors when it comes to barbecue. Check out my youTube video below of me cooking some baby back ribs on a smokin hot day at my home in the White Mountains of NH! A Brinkmann Smoker worth every penny! He went on and on about how great they tasted and he had never had anything like it before. I also smoked some sausages during that cook and he pretty much said they were the best sausages he ever ate. My father-in-law is an 80 year old Greek man and food is and pretty much has been his life so there’s some experience there when it comes to eating really good food. 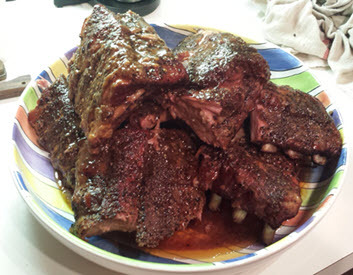 And this was only the 2nd time we had done ribs on this smoker but we made some small improvements over our 1st rib cook which certainly paid off. In my opinion, there is something really special about smoked meats and this Brinkmann offset smoker does it really well! One thing that you have to know going in is that you will have to fine tune this Brinkmann smoker! I cannot stress this enough because the last thing I want you to do is to purchase this smoker, try to use it, and get frustrated. If you try to use it right out of the box, you will run into some issues like leaky joints, uneven heat across the smoker, and a poorly-placed thermometer that will not read the temperature at meat level which is what you need. As a result, it will be hard to maintain temperature, the grates nearest the firebox will be much too hot in comparison to the grates furthest away, and you won’t know the true temperature at which you are cooking. I will be going into detail in another article that will detail the enhancements that I have made to my Brinkmann Trailmaster thanks to a lot of other really good grillmasters out there who have shared their tips. I made it a point to make these enhancements before I did my first cook so that I wouldn’t be frustrated and give up on my smoker. All I know is that this offset smoker has literally changed my grilling and barbecue life. Check out the ribs I smoked last week! I’m looking forward to sharing with you the enhancements I made and what I have learned from my initial experiences with this offset smoker. 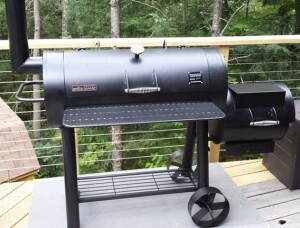 And, in time, I’d like to share how I will perfect my skills using this Brinkmann smoker. I’m that confident that I will be able to crank barbecue as good as anyone in time. Stay tuned!